Orbital Corporation Limited, a developer of fuel and engine technologies, has announced that it has delivered the first shipment of Unmanned Aerial Vehicle (UAV) engines and propulsion systems to Insitu Inc., a subsidiary of The Boeing Company. Orbital has previously announced an Insitu order for UAV engine and propulsion systems with a contract value of A$12 million. This order covers Insitu near term requirements, while the parties negotiate a Long Term Supply Agreement. To fulfil this order, Orbital has developed a supplier base along with state-of-the-art production and test facilities at their Balcatta, Western Australia headquarters. This first production shipment is a key milestone for Orbital’s UAVE division and is the culmination of several years of extensive Insitu-Orbital design, development and testing to create an engine and propulsion system to power Insitu’s latest ScanEagle UAV. Orbital’s UAV engine, designed and developed by Orbital and Insitu, is the first ground-up design for this class of UAV that has been extensively tested and validated by a major UAV manufacturer. 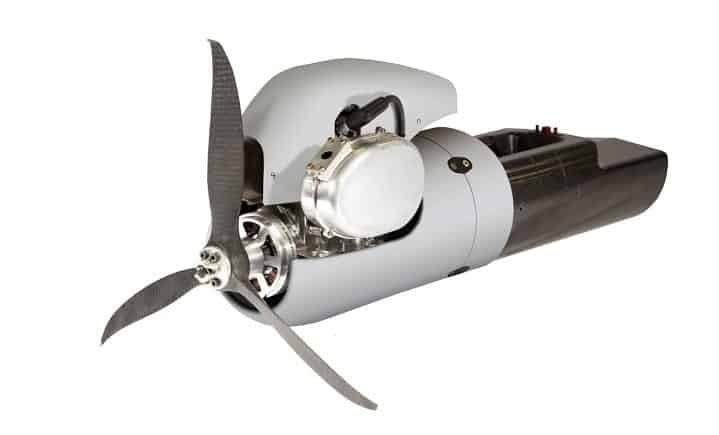 For ScanEagle, this engine is supplied as a complete propulsion system unit, integrating the fuel supply and IC engine systems to increase reliability and simplify field operations. The new technology delivers advancements not available on other UAVs in the same class, including real-time monitoring and diagnostics of all critical systems, sensor and actuator redundancy, and extensive “black box” recording capability. The new package will deliver enhanced performance, power-to-weight ratio, ability to run on heavy fuel, cold start capability, benchmark fuel efficiency, and other advancements. The system features a number of improvements over previous systems, including the “Argon” engine control unit, which weighs less than 150gm and drives the highest level of performance for heavy fuel engine applications in this class of UAV. The new engine has exhaust systems designed to minimise heat and noise signature, and is installed with compact fuel and oil tank modules that simplify the assembly of the UAV and allow easy in-field servicing. Orbital has established a solid relationship with Insitu. The Insitu ScanEagle is one of the most widely recognised light reconnaissance UAVs in use globally, and after more than 10 years in operation, is currently used by more than 20 countries. Orbital has been working with Boeing and Insitu since January 2013 as part of an initial design, development and validation contract to supply a new engine and propulsion system for Insitu’s existing and future platforms. Insitu’s ScanEagle platform will be the first to field the new engine and propulsion system. ScanEagle is a complete system comprising six air vehicles, a ground control station, remote video terminal, a launcher and a runway-independent SkyHook recovery system. It is not uncommon for each system to also include spare engines and propulsion systems. The wide acceptance of ScanEagle creates a significant opportunity for Orbital to build a high-revenue business producing and supplying Orbital UAV engines to Insitu and their growing global customer base. The first production shipment is the latest milestone on the path to securing a Long Term Supply Agreement with Insitu. Insitu and Orbital share an ambition to set a new standard for the industry with the new ScanEagle UAV. The current A$12m production order is projected to fulfil Insitu’s immediate customer requirements. This initial order is being delivered from Orbital’s upgraded facilities in Balcatta, Western Australia. Orbital intends to establish a base in the United States for engine repair and rebuilds. This new US facility is expected to evolve into United States based production facility as production numbers increase. Orbital is currently investigating suitable locations for these UAVE facilities and intends to develop a flexible approach to cater for anticipated accelerated customer demand for ScanEagle UAV.